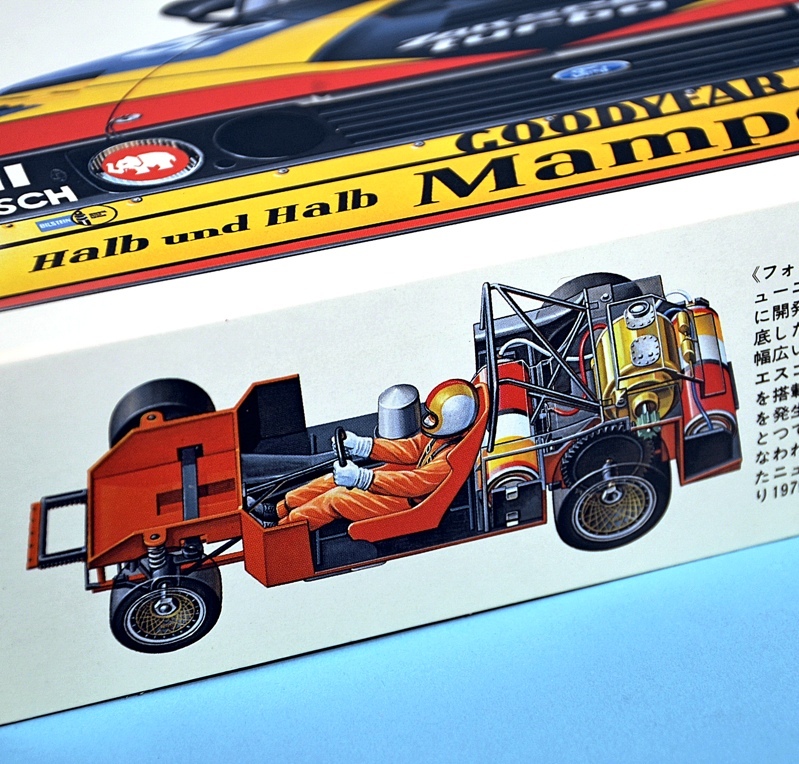 This is one of Tamiya’s latest kits in its 1:24 scale Sports Car Series. The car is a highly modified Ford Capri in Group 5 racing guise, as seen in the 1981 German DRM (Deutsche Rennsport Meisterschaft) auto racing series. 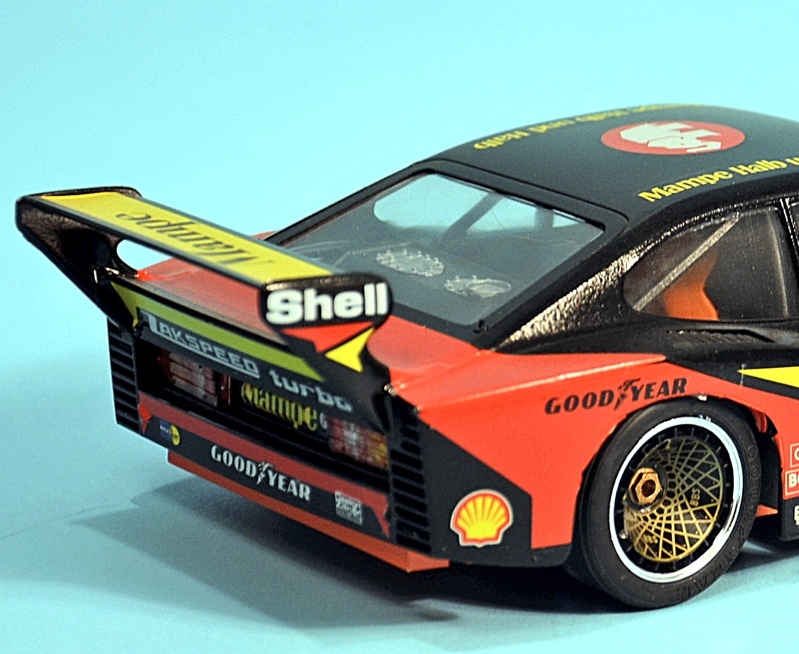 That 1981 date might give you a clue that this is not a brand-new kit, the original version going back to 1980, in the early days of this Tamiya 1:24 scale range. Then the kit was number 14 in the range, this latest is number 329. 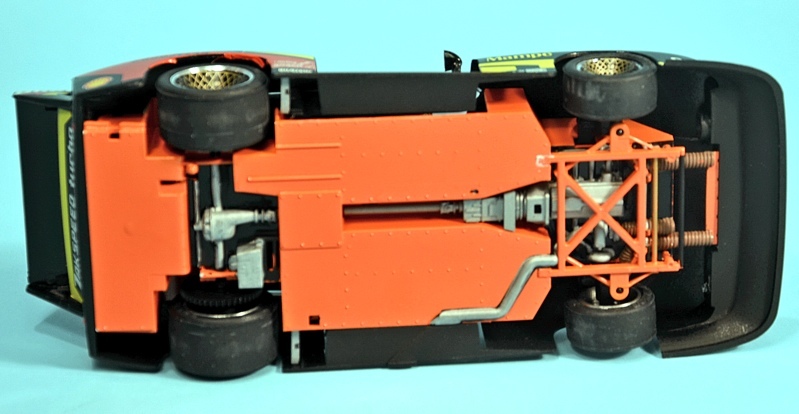 Parts layout for the new release (above) with the rear chassis (below), where the motor used to be located. It sat between the rear wheels, battery at the back. The age of the kit is also signified in that it was originally intended to be motorised. 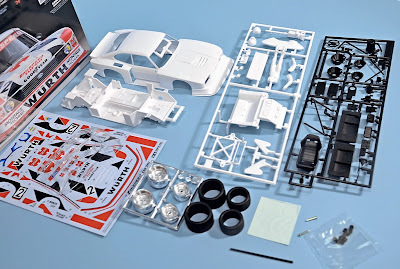 Even in the 1980s, many Japanese car kits still had this feature, originally intended to be a compromise between a full ‘scale model’, and something that still had an element of ‘play value’. The first issue was motorised, but by the second issue, in 2004, this element had all but gone, Tamiya instead turning its attention to motorised radio-controlled large-scale model cars. The box-top (below) shows the second issue, number 274, with the car in blue and black. 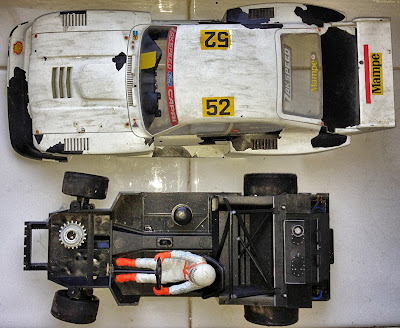 Scale model purists need not worry too much, as the motorisation was done with skill and care. When viewed from above, the mods to the chassis pan that originally took a motor and battery cannot be seen. 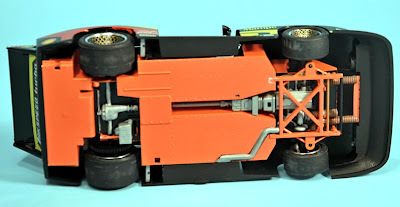 Admittedly there is some compromise if you turn the chassis over, as some details are lost, but this does not show if the model is displayed in the usual upright position! Box (above) and side-panel (below) of the first Tamiya Group 5 Capri, issued in 1980. The age of the original tooling also means it’s a somewhat simple kit, but there’s no harm in that; sometimes it’s nice just to be able to assemble a model without having to deal with too many intricacies! You also get a neatly-sculpted driver figure in the kit, which always helps with such a model. 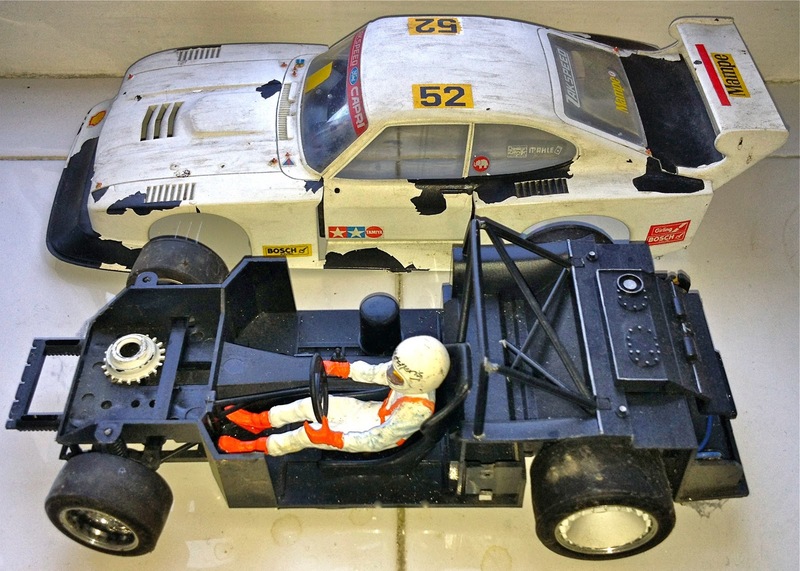 The original kit built up (above, below). The new one is identical, apart from colours, markings and lack of motor. Although simple in construction, racing cars such as this are made by the final finish. Here the main colour is white, the moulding colour of the majority of parts - but, as is common with these types of Tamiya kit, there is a very comprehensive decal sheet. 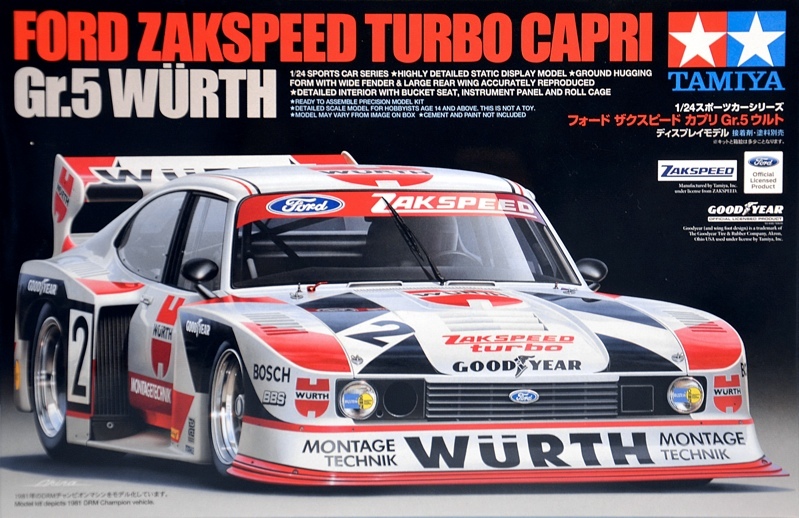 This features the black and red panels, and all other sponsor markings of Wurth, the German auto-parts manufacturer, whose name is displayed prominently on the front spoiler and on the doors. The kit’s first issue had the black, red and yellow markings for Mampe, the Berlin-based drinks company with its distinctive ‘elephant’ logo. The reissue in 2004 was in the striking black and blue markings of D&W, the German motor accessory company. 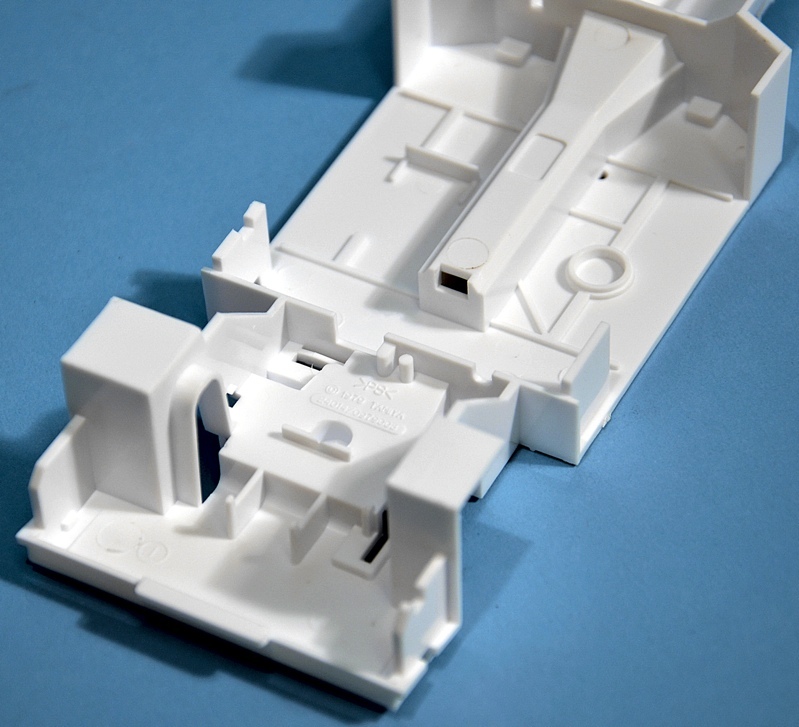 The underside of the original kit (below), shows that the underbody pan hides most of the modifications required for motorisation. * Parts: 50 (plus five parts not used), moulded in black, white and clear styrene, four vinyl tyres and metal axles. 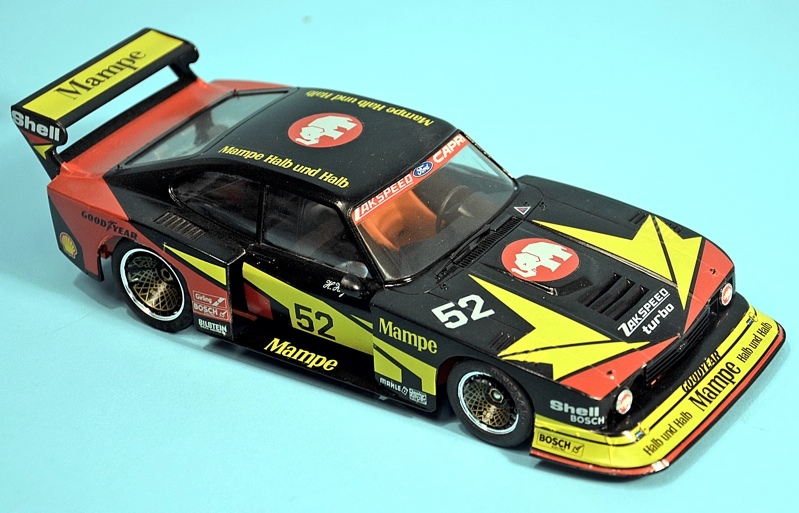 Incidentally, the DRM championships lasted from 1970 to the mid-1980s, and were dominated by these Group 5 cars, nicknamed ‘the silhouette formula’. 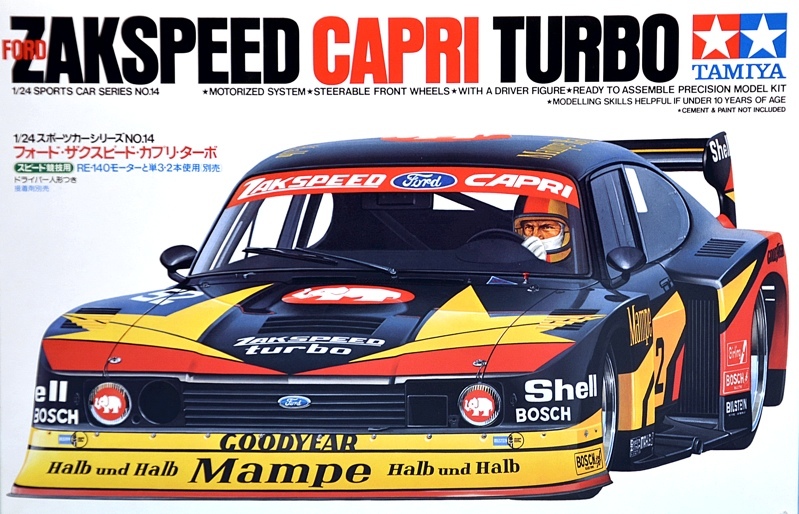 There were two divisions within Group 5: one for engines over two litres and one for under, so the Capri, with a 1500cc engine ran in the latter. 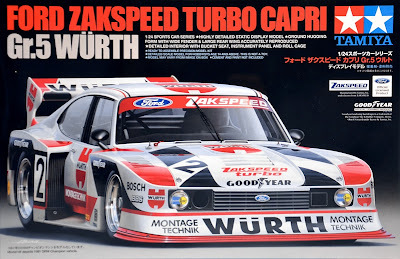 However, with tuning from Zakspeed, the four-cylinder engine, originally developed for Formula 2 racing, could generate 375hp. 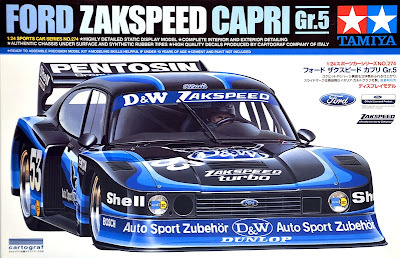 Tamiya Capri racing car kit here. 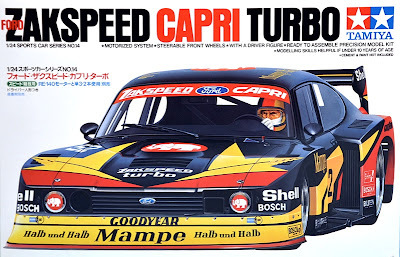 Deep in the SMN Portal of the Past (aka the garage) lurks this original motorized Capri. It’s looking a bit worse for wear and the carefully sprayed non-standard white finish is peeling away from the black bodywork. But the motor - neatly hidden by Tamiya’s talented kit engineers - still works at the slide of a switch. In fact, the motor and single AA-size battery add a nice heft to what is otherwise a featherweight model. Whether the model is worth a cleanup and respray is a moot point though. As it is, the car makes for a somewhat careworn, but interesting museum piece.